Screen Print on Fabric: For the 3rd of our projects this semester, we had to create two "positive" images, and burn them into screens, registered, and make 2-color prints on fabric. Registered means that you can easily place the print from one screen exactly on top of the print from the other screen. 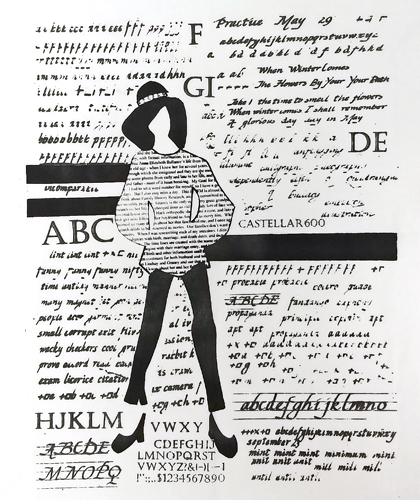 I had the fashion model with the horizontal stripes on one screen and all of the calligraphy/typography on the other screen. The first screen was printed in black (figure) and the second one in charcoal gray (typography). The print measures 15 X 19" The background fabric is white. Original Art Inspiration: I sketched a live model in a Fashion Illustration course last year and then collaged over the drawing. 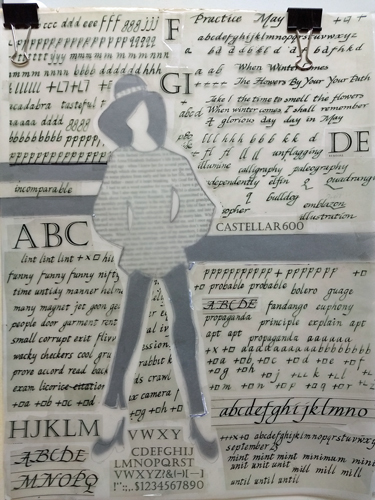 Creating the designs for the Screens: The positive images for the screen #1 were created by collaging black paper and typed words, that were printed on a transparency, to create the blouse. All the pieces were taped to heavy vellum to photograph (burn) them onto a photoemulsion screen. The calligraphy for screen #2 was printed on transparency sheets and cut out and taped to a second piece of vellum to make the other screen. Here are the two sheets of vellum clipped together for me to test the image. 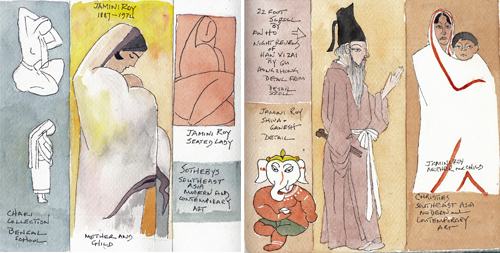 My friends and I love the Southeast Asian Modern and Comporary Auction Previews at Sothebys and Christies. These are painters from the 21st C, and several of our favorites were in a group that began modern Indian painting. I went to both big auction houses to see the auction previews during Asian week, and just painted portions of a few of my favorites. The paintings on the left were from Sothebys. The paintings on the right were from Christies. All of the images are from India, except the middle figure on the right. That was copied from a very long Chinese scroll. Figuary is over for 2019, and I really enjoyed Kenzo's short instructional videos and drawing Larry Withers Models. I sketched a pregnant model many years ago, and was delighted that Croquis Café had one on Day 3. In 2010 I enjoyed converting the images into Quilt Journal Pages (8.5 X 11") using dyed fabric and several methods to transfer the images. 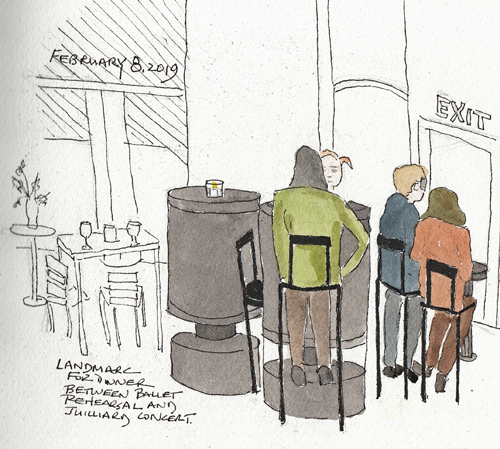 The model at Croquis Café on Day 3 of Figuary (Feb 3, 2019) was excellent. These are most of the sketches that I did of her. 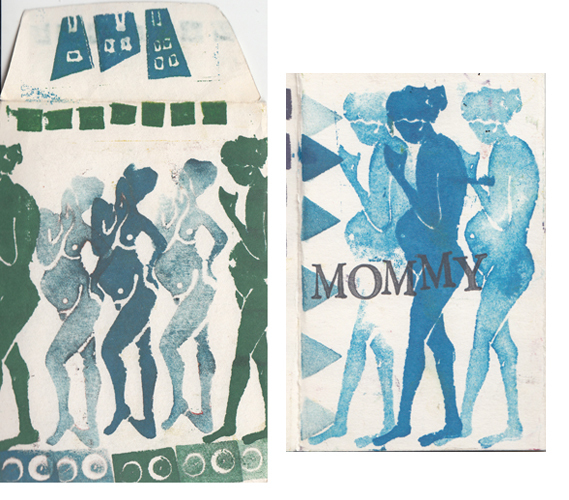 In 2010, I even took some of my drawings and made stamps - and here is a small folded book of stamped images, and the envelope that I made for the book. Love Life Drawing and Croquis Café, both You Tube channels you can subscribe to, sponsored a daily challenge this month. Kenzo gave 4-5 minute lessons at Love Life Drawing, and Larry Withers introduced the model session at Croquis Café, each day. 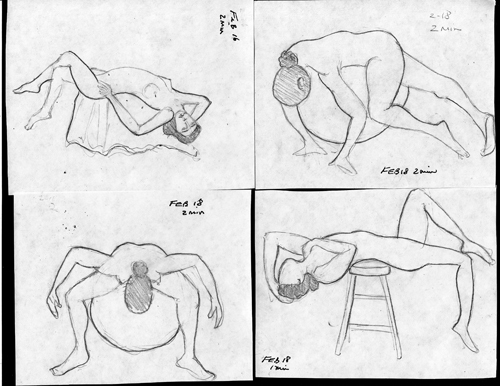 The models posed for three 1 min, two 2 min, and one 5 minute pose. Obviously you could pause the video for as long as you wanted, but I tried to finish the drawing in the allotted time, and usually just had to pause for another minute with the 1 minute poses. These are a few poses I really loved drawing. Kenzo said that all of the videos would remain indefinitely. In the first images, I made a quick sketch in pencil and then finished it in ink after the time was up. In the second images I sketched in pencil, and then darkened a few lines after the sketch was done. Even if I paused the video, I never took more than 20 - 25 minutes for all 6 sketches, probably because I used small scrap papers for all of them. This was so enjoyable that I only missed several days so far.